Morphine mediates its euphoric and analgesic effects by acting on the μ-opioid receptor (MOR). MOR belongs to the family of G-protein coupled receptors whose signaling efficiency is controlled by the regulator of G-protein signaling (RGS) proteins. However, the understanding of the molecular diversity of RGS proteins that control MOR signaling, their circuit specific actions, and underlying cellular mechanisms is very limited. Now a study from researchers at The Scripps Research Institute (TSRI) has shown that a specific molecule controls morphine receptor signaling in a small group of brain cells. The team state that the findings could lead to a new drug target for developing less-addictive pain medications and even offer a clue to the genetic predisposition of patients to addiction before treatment. Prevous studies show that opioid receptors are expressed in pain-modulating descending pathways, which include the medulla locus coeruleus, and periaqueductal gray area. They are also expressed in limbic, midbrain, and cortical structures. The activation of opioid receptors at these locations directly inhibit neurons, which in turn inhibit spinal cord pain transmission. 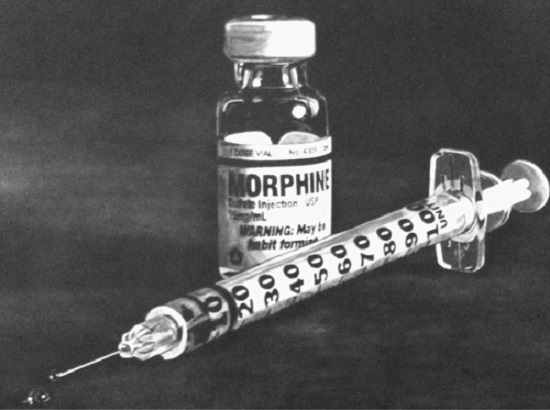 To date, the molecular and cellular mechanisms mediating the development of tolerance to morphine remain controversial. Earlier studies show that opioid receptor downregulation does not occur consistently with each and every agonist and may not completely explain tolerance. It has been suggested that MOR proteins are not downregulated and may instead be desensitized and uncoupled from downstream signaling pathways. Thus it has become critical to understand the mechanism involved in the development of morphine tolerance and highlight the important implications of ligand-selective responses in G-protein coupled receptor biology. The current study used genetically modified animal models lacking a particular RGS protein called RGS7, this molecule is a known regulator of G protein signaling (RGS) protein, which in turn controls the morphine receptor or the mu opioid receptor. Results show that eliminating the protein enhanced reward, increased pain relief, delayed tolerance and heightened withdrawal in response to self-administered morphine doses. The lab explain that without the protein, the animals are predisposed to morphine addiction. The group explain that the mu opioid receptor acts as a conductor of the drug’s effects, while RGS7 acts as a brake on the signal. In the current study the animals could press a lever to receive an infusion of morphine. The researchers looked at the number of lever presses and used electrical recording techniques to determine how much the animals liked it and which mice craved the drug more. In addition to drug craving, results showed that the animals lacking RGS7 also worked harder to obtain a food reward, further suggesting that RGS7 may be a more general regulator of reward behaviour extending beyond drug-induced euphoria. The team state that their study reveals a unique modulatory role of RGS7 in a brain-region-specific action to morphine use and indicates RGS7 as a potential drug target. They go on to conclude that pharmacological intervention at the level of RGS7 may reduce some of the detrimental side-effects associated with opiates. The researchers surmise that if their findings hold true for human patients, the global medical community could look specifically for RGS7 levels for any disabling mutation with a simple blood test. For the future the lab forsee mutations indicating a strong reaction to a drug such as morphine with people carrying a deficient copy of the RGS7 gene maybe needing a much lower dose of opioids. “It has been suggested that MOR proteins are not downregulated and may instead be desensitized and uncoupled from downstream signaling pathways.” Could you provide some references for these findings?